Support for this resarch was provided in part by a NASA Graduate Student Reasearcher Program Fellowship administered through the Jet Propulsion Laboratory, by Jet Propulsion Laboratory grant 959333, and by the Advanced Research Projects Agency under Office of Naval Research contract N00014-91-J-4038. The design principles governing the hardware organization of Attila (and Hannibal) is covered in Colin Angle's Master's thesis, "Design of an Artificial Creature". The thesis covers the mechanical and electronic design of the robots, emphasizing a modular subsystem architecture. For instance, each leg, the head, and the body could be treated as a separate module complete with actuators, sensors, and a satellite microprocessor. 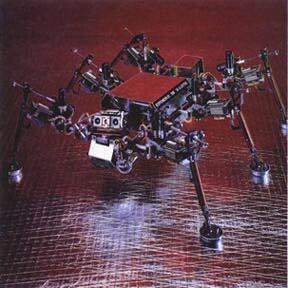 The design and construction of these robots was challenging given the size and weight constraints of the system as well as its overall complexity. A significant amount of hardware redundancy was included in anticipation of possible failues during a mission. From a mechanical standpoint, this redundancy took the form of multiple legs--it is well known that insects can still locomote with the loss of a leg. From a sensing standpoint, redundancy took the form of complementary sensor suites. Sensory signals from different types of sensors can be combined to characterize different types of leg-terrain interaction, which is used to guide the robot's behavior. By using complementary sensor suites, if a few sensors fail over the course of a mission, the remaining sensors can still be employed for robust sensing of the environment. Attila and Hannibal are recognized as being among the most sophisticated autonomous robots for their size, possessing over 19 degrees of freedom, over 60 sensory inputs, and over 8 microprocessors. Naturally, with a project of this magnitude, several graduate students and staff researchers assisted in the design and construction of these robots. Even with several dedicated researchers, the design phase was lenghty--starting in the summer of 1989 and continuing until completion in June 1991. The design principles governing the software organization of these robots is covered in Cynthia Breazeal(Ferrell)'s Master's thesis, "Robust Agent Control of an Autonomous Robot with Many Sensors and Actuators" (see publications section). The behavior-based software written for Hannibal and Attila addresses several issues that face legged micro-rovers. One important issue is real-time behavior, especially maintaining real-time behavior as the complexity of the system is scaled (see "Global Behavior via Cooperative Local Control" in the publications section). It is important that the robot respond quickly to hazards and perform effective evasive manuevers. Given the complexity of the robot (large number of sensors and actuators) and fairly limited computatinal power, the controller must avoid computational bottlenecks that could compromise real-time performance. This places constraints on the algorithmic techniques used for perceputal processing and motor control. Another important issue is rough terrain locomotion. It is well known that legged animals are capable of traversing far more rugged terrain than wheeled vehicles. One reason for this is that legs can handle discontinuities in the terrain, whereas wheeled vehicles require smoother terrain. However, it is a challenge to program legged robots to perform as adeptly as their biological conterparts (see "A Comparison of Three Insect Inspired Locomotion Controllers" in the publications section). In fact, animal locomotion is still superior to any artificial walking machine in existence. A third important issue is fault tolerance. 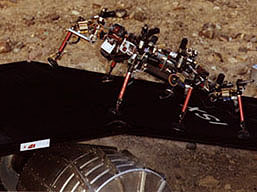 Any planetary rover performs its mission in a hostile environment. The possiblity of either mechanical or electronic failures occuring is high. Furthermore, no one will be around to fix the failure. Hence, fault tolerant behavior is important to preserve the integrity of the mission. The robot must be able to detect and recognize hardware failures and act to remedy these failues. Ideally, the robot would always maintain a level of performance that is as high as possible despite these failures (see "Failure Recognition and Fault Tolerance of an Autonomous Robot" in the publications section). The software was designed to address these issues and take advantage of the modular subsystem architecture of the robot as well as its complementary sensor suites. The compelete controller represents a substantial amount of work which took place starting in June 1991 and ended in the spring of 1993. Our lab installed a simulated lunar environment, called the "sandbox", to test the performance of our rovers in more realistic environments. The sandbox is about 15ft long by 10ft wide and consists mostly of gravel and sand with several larger rocks interspersed throughout. The robots are required to negotiate the terrain while avoiding obstacles and hazards. This testing environment helps us assess whether or not the robot will perform adequately in scenarios which are more realistic than a typical laboratory environment can provide. In this picture, Prof. Rod Brooks is taking a photo op in the sandbox with Attila and Genghis. Attila and Genghis were invited to a planetary rover exhibition at the Smithsonian Air and Space Museum. While at the show, Colin Angle and Cynthia Breazeal(Ferrell) had the opportunity to meet former US astronaut (and senator) John Glenn (leftmost picture). 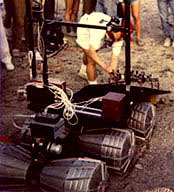 Hannibal was invited to Death Valley by the Planetary Society to participate in a variety of micro-rover tests. The gathering was a multi-national event. 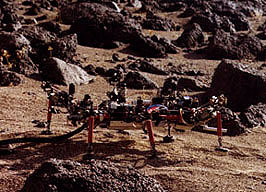 One test (shown above) was a rendez-vous mission with the Soviet research team's planetary rover. In this test, Hannibal docks with the larger Soviet rover. 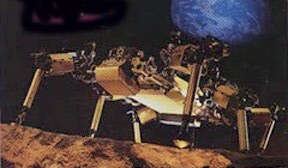 As shown in the picture, Hannibal docks with the Soviet rover by climbing up a ramp onto the larger rover's back. Another test involved traversing rough terrain. Death Valley is a good place to conduct these tests since the terrain is very similar to the terrain a rover would encounter on Mars. Hannibal and Attila enjoyed quite a bit of media coverage along with the rest of the mobots in the mobot lab. Check out the Mobot Lab media page.) for a list of articles written about the Mobot Lab by the popular press. 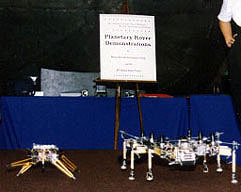 Angle, C. & Brooks, R. (1990), "Small Planetary Rovers'', in Proceedings of IEEE International Conference on Intelligent Robots and Systems, Ibaraki, Japan, 383--388. 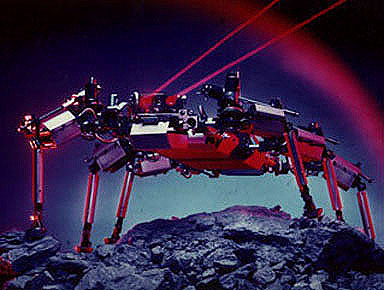 Angle, C. (1991), "Design of an Artificial Creature", Masters Thesis, MIT Department of Electrical Engineering and Computer Science, June 1991. Brooks, R. & Flynn, A. 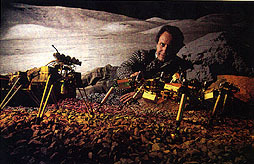 (1989), "Fast, Cheap, and Out of Control; A Robot Invasion of the Solar System'', Journal of the British Interplanetary Society, 42:10, 478--485. Ferrell, C. (1992), "Multiple Sensors, Virtual Sensors, and Robustness'', in Proceedings of the Sensors Expo, Chicago, Illinois, 55--62. Ferrell, C. (1993), "Many Sensors, One Robot'', in Proceedings of IEEE International Conference on Intelligent Robots and Systems, Yokohama, Japan, 399--406. Ferrell, C. (1993), ``Robust Agent Control of an Autonomous Robot with Many Sensors and Actuators'', MIT Artificial Intelligence Lab Technical Report 1443. Ferrell, C. (1994), "Failure Recognition and Fault Tolerance of an Autonomous Robot'', Adaptive Behavior, 2:4, 375--398. 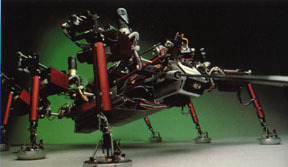 Ferrell, C. (1994), "Robust and Adaptive Locomotion of an Autonomous Hexapod'', in Proceedings From Perception to Action Conference, Lausanne, Switzerland, 66--77. Ferrell, C. (1994), "An Autonomous Mobile Robot, a Planetary Microrover'', Sensors -- The Journal of Applied Sensing Technology, 11:2, 37--47. Ferrell, C. (1995), "A Comparison of Three Insect-Inspired Locomotion Controllers", Robotics and Autonomous Systems, 16:2-4, 135--159. Ferrell, C. (1995), "Global Behavior via Cooperative Local Control", Automonous Robots, 2:2, 105--125.